Current traffic conditions as of September 27 at 12:30PM: Traffic continues to flow on all roads leading into Camden with no delays. Mickle Blvd continues to be blocked. 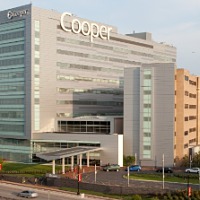 We want to thank you for choosing Cooper. As you are probably aware, the city of Philadelphia is hosting two large scale events, the World Meeting of Families that will take place from September 22 through September 25, 2015, and Pope Francis visit on September 26 and September 27, 2015. As announced by regional authorities, due to security concerns and the large number of visitors expected at these two events, road and bridge closures in the region and revised public transportation schedules will impact travel in Pennsylvania and New Jersey. This will affect travel times to and from Cooper University Hospital. Recognizing that visitors are important to patients recovery, there will be no change in patient visiting hours. However, please note that you may experience travel delays and/or parking limitations in Camden City. Please allow at least two- to four-times the normal travel time. 	During this time, the Emergency Department and all acute care services at Cooper will be open as normal. 	All community-based ambulatory offices in the suburbs will be open as normal. 	Outpatient ambulatory offices located in Camden will be closed on Saturday, September 26 and will re-open at noon on Monday, September 28. Appointments previously scheduled have been moved to ambulatory offices in the suburbs or rescheduled. 	For greater convenience, Coopers three community-based Urgent Care Centers in Cherry Hill, Audubon and Sicklerville, NJ, will have expanded hours from 8 a.m. to 8 p.m. on Saturday, September 26 and Sunday, September 27. If you have any questions or concerns, please see any Cooper staff member. Please visit the following official websites for regional updates and traffic information during the Papal visit.